Could This Time Capsule 1978 Chevy Chevette Pull $5,000 Canadian? Today’s Nice Price or Crack Pipe Chevette is claimed to be original, right down to its - now most likely coprolitic - tires. It also rocks low miles, a jazzy plaid interior, and the desperate need for you to judge the originality of its price. Chevy’s attempts at a home-grown small car had not proved hugely successful by the time they introduced the Chevette in 1976. The first - the Corvair - suffered profitability challenges over its design which was more complicated and less leverage-able than the competition - among other issues. The major issue with the Vega was that it turned out to be a sort of reverse sea monkey, turning inanimate when exposed to water. The Chevette replaced the Vega as Chevy’s cheat seats ride - so cheap in fact that a Scooter model was made available lacking even a back seat. The basic platform, along with much of the body, was part of the Opel-originated T-platform, which also served as the Kadett C, Isuzu Bellett (I-Mark), Pontiac T-1000, and about a gajillion others. Most North Americans however, only remember the Chevette. That and the Alamo. The reason for that is likely because it had a remarkable 12-year production run (the Chevette, not the Alamo), bridging the C3 and C4 editions of Chevy’s other ‘Vette, the Corvette. A funny thing about the second syllable shared between the two cars’ names- pick up artists could go into a bar and tout ownership of a “‘Vette,” and it wouldn’t be until the unsuspecting target of their advances got to the parking lot that they’d discover it was a Chevette and not a Corvette. Game over, man! That might not happen with this ’78 Chevette. The years have been kind to this one, and seeing as there are hardly any of these on the roads today - moving it into classic status - using it as your wingman (or woman) at the neighborhood booze and lose might actually improve your game. At the very least you can impress the crowd by demonstrating what it really means to ‘wind up the window’ as this little Chevy is old and basic enough to feature actual cranks for the door glass. You can also let them marvel at a drivetrain designed neither for comfort nor speed. 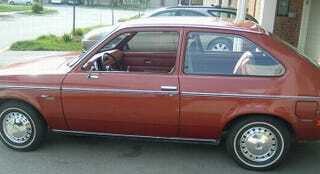 For the ’78 model year the Chevette featured a 60-horse G161Z SOHC inline four from Isuzu. That’s backed up here with TH180 3-speed automatic to ensure that no speed-related accidents occur. Zero to sixty? Maybe! Yes, the car will be slow, but at least it doesn’t offer delusions of grandeur, what with its 140 kph speedo. That’s 86-miles per hour for those of you who are metric-phobic. The speedo and a gas gauge are the only needles in the dash, the rest of the gauge cluster offering just idiot lights and faux holes to mock your poverty on every drive. The rest of the interior is in both in excellent shape and a plaid pattern not seen since the Bay City Rollers career was snuffed out by people of taste. Still, this is an excellent example of what the ‘70s were like, and why it must never come back. On to the outside, and things are equally tidy. The car rocks only 31,000 kilometers - or less than 20K in miles - and the paint still holds a shine. The full-wheel metal jacketed steel wheels are another throw back, as are the white-wall tires. Those are supposed to be the original meats so should you buy this, don’t go anywhere except the tire store on them. The ’78 featured some visual updates over its predecessors, including chrome trim around the headlights and a grid-ier grille. Both of those - along with the chrome steel bumpers - looks intact and to be in excellent shape. In fact, only a modest dent in the driver’s door seems to detract from the car’s overall appearance. The seller is asking $5,000 Canadian to step into this Chevy time machine. Yes, when new owning one of these was an soul-sucking admission of either abject failure or a complete and utter lack of interest in the trip over the destination - or how long it took to get there. Today however, it’s a unique classic, and an eye into a dark time in North American auto production. That’s got to be worth something, right? Ah, but is it worth that $5,000 - or about $4,100 American, 3,775€ in the EU, or 545,544 Shi Lankan Rupees? What do you think, will the seller get close to that? Or, at that price will this ‘Vette prove hard to get rid of? AutoTrader Ca out of Milton Ontario, or go here if the ad disappears. H/T to AlienDNA for the hookup!